Natalie Livengood is one of our youngest Change Bandits. Lauren Livengood is mother to 1-year-old Natalie, a Neonatal Intensive Care Unit (NICU) graduate with Shwachman-Diamond syndrome, a rare genetic condition that affects the bone marrow, pancreas and skeletal system. 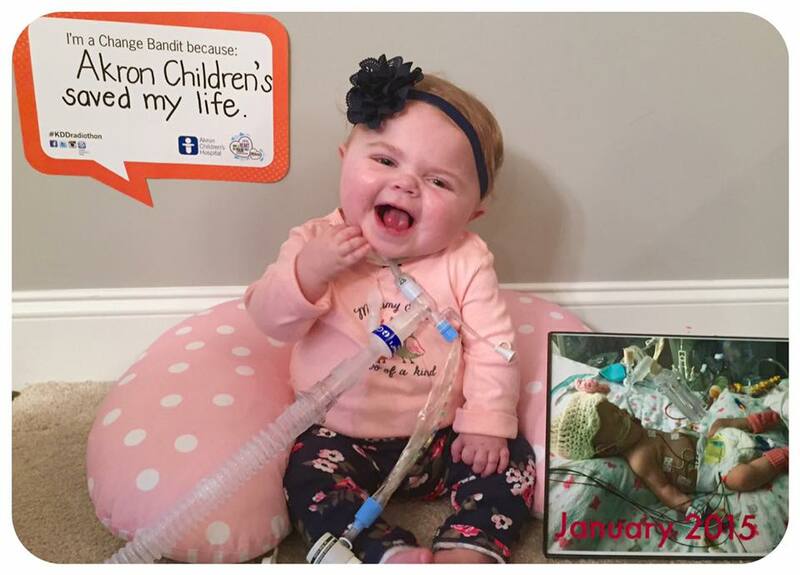 The Livengoods have a long history with Akron Children’s Hospital, including a 9-month hospital stay beginning when Natalie was just 5 months old. Here, Lauren explains why supporting the hospital is so important during the upcoming “Have a Heart, Do Your Part” Radiothon on 98.1 KDD. Last week when I sat down for the Akron Children’s Hospital Radiothon interview, the last question Keith Kennedy asked me was to put into words (in 15 seconds) why someone should donate to Akron Children’s Hospital. You know how they say it takes a village to raise a child? That’s never truer than when your child is in the hospital. When your child is sick, you are willing to do anything to make them well and bring them home. You’d give your all. But your all isn’t enough, and that feeling is like no other. That’s where the village comes in. Doctors, nurses, therapists, social workers. All of the staff, all of these strangers suddenly are a part of your family, your village. Their knowledge and their skill that they’ve gained through this hospital – is it enough for your child? Has the research been done? Is the equipment available? It all can bring you to your knees. And then, when you’re forced to take a break from being your child’s advocate to take care of yourself, if only for a few moments, is there food available at this hour? Are there showers around? Are there okay sleeping conditions here so you can stay at your child’s bedside? Those kinds of resources go a long way in bringing comfort to a stressed family away from home. When your stay drags on longer than you’d like and you feel down, special events and small gifts might be the only thing to bring a smile to you and your child. My daughter’s first picture with Santa? It was taken in a hospital room. I have that special memory because Akron Children’s Hospital does those kinds of things for families. She had hospital photographers come in for the photo shoots that we weren’t able to have otherwise. She was gifted stuffed animals, toys and blankets. She had visits from the Doggie Brigade and from music therapists because those kinds of programs are offered at Akron Children’s. All of these people were a part of our village, and I’ll be forever grateful. Although we’re home and happy now, many other families are living it every day and every night. Can you imagine if it was you? Can you imagine now what your donation could add to the village? A little bit from many caring people adds up to be a lot. That’s why you should give. Hear more about Natalie’s story – and those of other patients – by tuning in to the 17th annual “Have a Heart, Do Your Part Radiothon,” broadcast live from Akron Children’s Hospital Atrium by 98.1 KDD Feb. 11-13. Click here to support the 2016 Radiothon.